Now that the holiday season has officially commenced (I consider the day after Thanksgiving Christmas season! ), it’s time to start thinking about all of those fabulous holiday parties you’re going to attend. Here are some favs of mine that will bedazzle your party festivities! This color is my absolute fav because it’s so sparkly and fun! The glitter is not huge chunks so it evenly glides across your nail without a hassle. Three coats does the trick and makes me feeling like I have bling all over my fingertips (not just my wrists). If you want to make a huge difference in your party look, throw on some of this falsies and voila! Your eyes look like a force to be reckoned with. I have long eyelashes so instead of applying and entire strip I merely just glue on these babies and it gives me an extra little flirt to my look. Buy them online or at Sephora — they have a fabulous Make Up For Ever Lash Bar that is too sweet to not indulge in. Last year for my sorority’s formal I told one of the Sephora associates that I was looking for a fantastic red. My dress was red and I needed a great tone that wasn’t too blue or too orange for my skin tone. She sat me down and applied this magic wand to my lips and I can’t get enough! I still have it, so it lasts you about year and then some. They have other fantastic colors as well, but if you need a great red I recommend Cruella. When I went home for Halloween I got a ton of compliments on how healthy my hair looked, which was surprising considering the amount of bleach my hair stylist uses to spruce me up! Whenever I get out of the shower I apply Nectar of the Gods to my hair and comb it through before blow drying. It makes a huge difference on how my hair looks and feels. I like it best though after my shower at night when I let my hair air dry. It’s essential for restoring damaged hair! This weekend I hit up some Black Friday sales and made some cost effective purchases. Gap had a buy a sweater/get a sweater free deal, so I got two adorable, above-the-knee sweaters for the winter weather. They are perfect over a sweater dress or with skinny jeans and boots. (I couldn’t find them online! Still searching for photos). A perfect addition to any holiday house party is a low-key fragrance to remind your guests of their childhood Christmas’ (or Hanukkah’s or Kwanzaa’s). 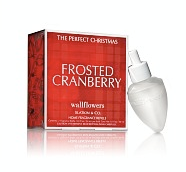 Bath and Body Works has winter-inspired Wallflowers that will immediately brighten the mood. They’re great as gifts too! I recommend Cinnamon Stick, Evergreen, Winter or Frosted Cranberry scents. Previous PostPrevious Because who says the holidays have to be green and red?